BALLYCONNEELY: Beaches, seaside walks, golf, surfing, Derrygimlagh walk, pony trekking and fishing. 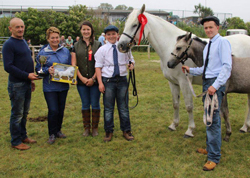 Highlight of the year is Ballyconneely pony show which is in July. 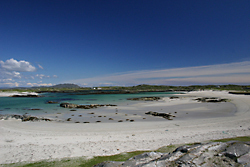 The village area known as Ballyconneely is located five miles south of Clifden on the R341 coastal road to Roundstone. 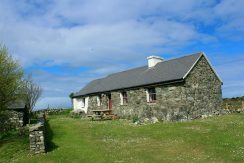 It is based on the Ballyconneely peninsula that juts out into the Atlantic which is the most westerly point of Connemara. The rocky promontories and wild coast are home to many species of seabird, seals and other marine creatures. Often sightings of dolphins and whales can be seen. In midsummer the corncrake can be heard. 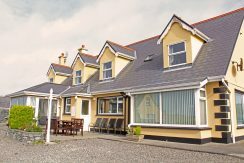 The main beaches in the Ballyconneely area are listed on our beach map click here, the most well know being the Coral Strand just on the Clifden side of the village, but there are many more top quality beaches close by. Dunloughan beach near Ballyconneely is one of the best known surfing spots in Connemara. Although conditions are not as gnarly during the summer months, from September to May you are guaranteed regular big swells, thanks to large storms far out in the Atlantic. 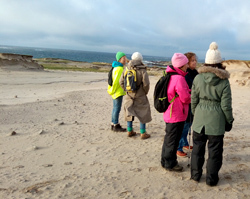 There are several beaches along this shore that are suitable for surfing, and it is best to enquire locally to find out more, Fan Tuath shop in Clifden is a good place to enquire, and some surfers are to be found in Mullarkys Bar in Clifden. The Ballyconneely lakes and beaches are also of great interest to the angler, with brown trout in the lakes and there are some good shore angling marks where a great variety of species can be caught. A favourite fishing spot is Bunowen Pier, where surprisingly large conger lurk in the stonework at the end of the pier, best fished for in the evenings. The village of Ballyconneely has two well provisioned shops one of which is a post office and there is also a filling station. Keoghs bar is a great spot for a pint and a bite to eat. There is also a church in the village with Sunday and evening masses. 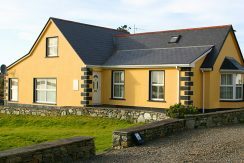 The golfer is well served by the Connemara Golf course which is a 27 hole links course on the southwestern side of the peninsula. 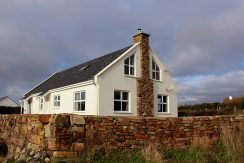 (details here http://www.connemaragolflinks.com ) This is a beautiful course formed from the natural sand dunes and grassland on the Slyne Head peninsula with a very well run clubhouse and reasonable green fees. The famous Connemara pony is bred in the Ballyconneely area and legend has it that the breed originated when Arabian horses came ashore from a Spanish Shipwreck near Slyne Head and inter-bred with the small native pony. The Connemara is famous for being hardy and sure-footed, and no surprise the breed evolved on the rocky coast of western Ireland, where it had to develop an ability to move quickly across rough terrain. The sometimes harsh Irish weather and unforgiving lan dscape helped develop a breed that is resilient and adaptable, and you will see them everywhere in Ballyconneely. 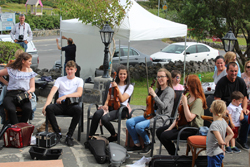 The Ballyconneely Pony Show is held in July, and is a precursor to the Clifden Pony show, and is a great day out for the family. Just down the road from Ballyconneely is Calla and beyond that Dolan between these two places is an amazing stretch of coastline with sand dunes, beaches and drifting sands, a very striking and interesting landscape. 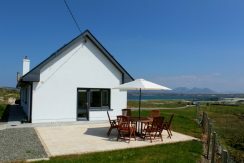 Renting a cottage in Ballyconneely is a great choice for your holiday in Connemara.